New stadium in Bregenz saw groundbreaking in 1950 and by early 1951 it was described as the largest and greatest stadium in Austria, outside of Wien. 7 rows of terracing around the field and running track was able to hold up to 12,000 people. This capacity figure is still commonly used, though actual size has long been smaller. 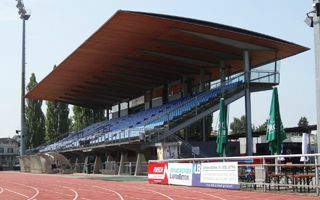 Primarily after the 1994 renovation, during which western terraces were razed and replaced by a new steel grandstand. Its interesting feature is extensive use of wood on the underside of the roof, ceilings and even each of the 12 rows of seating. The building stands just 200 meters away from Lake Constance waters, near the famous floating concert stage. For decades it was known as Alpenstadion (Alps Stadium), but from 2014 it bears the name of Gernot Langes-Swarovski. Swarovski, recognized worldwide, is the key sponsor of local sport and the WSG Wattens football club. Grandson of the famous Czech glass cutter carries on with legacy of Swarovski and also impacts local football, currently aspiring to reach Erste Liga (2nd tier).